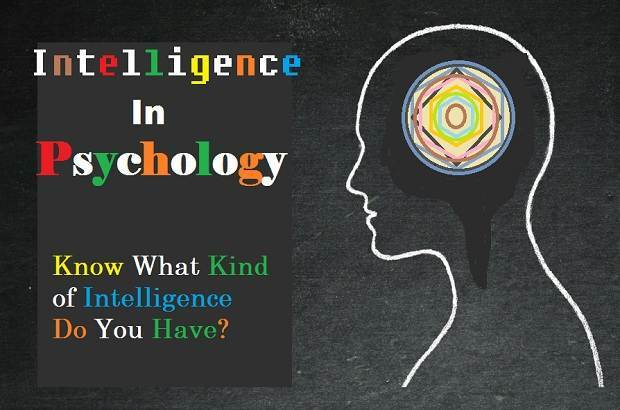 Home / educational psychology / intelligence in psychology / intrapersonal intelligence / logical intelligence / naturalistic intelligence / psychology / spatial intelligence / types of intelligence / verbal intelligence / Intelligence in Psychology- Characteristics and Types - Know What Kind of Intelligence Do You Have? The concept of intelligence differs from one person to another. Each psychologist has a point of view in his definition of intelligence but definitions can be collected that intelligence is the ability to understand, to innovate, to learn, to collect, to think abstractly. It is a speed of understanding and speed in the intuitive, intellectual and cognitive activity carried out by the mind. Intelligence is one of the qualities that distinguish people from each other and make one more successful than the other. Everyone wants to be intelligent to achieve what he wants. It is not necessary for intelligence to be linked to academic or systematic achievement as it is known to some psychologists. Intelligence may be referred to other aspects, such as social, linguistic, and athletic intelligence. Each person is characterized by one or more types of intelligence. The concept of intelligence is an old concept that appeared at the hands of the philosopher Cicerone Theodorescu. Philosophers relied on the method of observation in interpreting intelligence. They followed the method of self-introspection during the thinking processes or other mental activities. The theories and ideas, which philosophers reached only by observation, can only be adopted and approved by subjecting them to scientific and experimental methods of study. In psychology, intelligence is a kinetic sensory process with multiple and continuous capabilities that are activated and functioned after the factor and genetic predisposition are strengthened with appropriate external stimulants. Intelligence grows during the first five years of the child's life rapidly, then stops at the age of sixteen to eighteen to twenty. Intelligence may stop at this age and remain constant, and may increase with the activity of the intellectual person, and may decrease with progress in time If a person stops learning, and practices intellectual activities. Intelligence is influenced by genetic factors. When the parents are intelligent, the IQ of the child is increased. But this is also affected by the surrounding environment; the environment that encourages intelligence must be provided. Intelligence is not one of the instinctive habits in man. Some believe that intelligence is learning, and learning is instinctive, but the concept of intelligence is broad and learning is part of it. Development and change is accepted in intelligence when appropriate activities are available. Do you know yourself? How far do you know it? Can you describe yourself as intelligent? Well, if you think you're smart, do you realize your intelligence? These are questions that concern every one of us, especially the parents because they are worried when they find that their children are different in terms of intelligence, educational attainment, and grades, they make a lot of mistakes when they call someone stupid and describe others as intelligent. but why? It is often thought that intelligence is one type, an intellectual intelligence that relies entirely on strong memory, concentration, and the ability to memorize and study for long periods of time. However, the good news is that there is not one kind of intelligence, but rather a species. In other words, no human being on the face of the human being cannot be intelligent. Yes, his intelligence may differ. So we like to reassure the parents and comfort them that their children are not stupid, and at the same time encourage them to know the type and shape of the intelligence of their children, by knowing the types of intelligence. After reading this article, my reader will be able to classify the kind of intelligence you have and your children or partner so you can help yourself to choose the form of education that suits you or suits your loved one, gives you and gives them the largest amount of information with minimal effort. The measure of your IQ is up to experience, science, culture, society, environment, circumstances, and genetics. The natural mind of man possesses different kinds of intelligence, but there is a certain type that dominates the rest, which shows talent with it. Verbal intelligence (linguistic intelligence): Verbal intelligence is the ability to learn languages, whether spoken or written and to use them in self-expression and in addressing any communication with others. This is characteristic of writers and poets. Logical intelligence (mathematical): Logical intelligence contains logical analysis and problem-solving, scientific research, reasoning, deduction, and criticism. The person who has this kind of intelligence is smart at dealing with math and logical problems, and he always enjoys solving puzzles and reading scientific discoveries, wants to know how things work with computers and other devices in general. Sensory intelligence (bodily-kinesthetic): Sensory intelligence is the ability to coordinate and harmonize the movements of the body in order to achieve certain goals. Naturalistic intelligence: Naturalistic intelligence is the coexistence and adaptation to the natural environment, and the identification of different natural varieties. Interpersonal Intelligence (Social intelligence): Interpersonal Intelligence involves the ability to mix and interact with others, work with them, influence them, understand their desires and motivations, and are usually characterized by leaders, teachers, mentors, and sales representatives. Interpersonal Intelligence, also known as emotional intelligence (EI), emotional quotient (EQ), and emotional leadership (EL), is the intelligence that deals with human beings with different characteristics and qualities. This kind of intelligence is spread among people actively, is keen to understand different types, and has the ability to understand the psychological situations of many people without speaking, and is accepted by many people of different nature, because of emotional equivalence, and the ability to absorb different views, without losing any of the different parties. Interpersonal Intelligent is very active in business and group games, as well as the things that require leading people in a large project. Intrapersonal Intelligence: Intrapersonal Intelligence involves understanding himself and recognizing himself fully from motives, goals, and aspirations, drawing an effective model of his character, and has the ability to develop him. Musical Intelligence: This is the ability to recognize, distinguish and simulate tones, sounds, music, and rhythms. Spatial intelligence (visualization): Spatial intelligence is the perception of spaces and regions and the ability to estimate the size of space and shapes and the ability to comprehend three-dimensional images. The function of the brain as it relates to aging is memory and concentration, not intelligence. In fact, intelligence is not necessarily an important factor in maintaining effective brain function. There are differences in intelligence between men and women. Men use their brains faster to act and deal with problems. Women have a better ability to analyze complex topics. The theory of multiple intelligences expanded the educational outlook of students and has an impact and a hustle in educational circles. In this article, I have discussed some scientific research methods in order to intelligence is more in the person, because you know that everyone has a dissonant part of all these types. I have been interested in the subject, So I have tried the tests several times, and every time I got a different result because the choices of each test put you in a certain position and I have looked a bit for the electronic tests published based on this theory, but my point of view is that these tests do not have the ability to determine the quality of intelligence you have, because you can often guess that the answer will get you to a certain result - you might like to be your outcome. I can say that these tests may give you an overview of each intelligence. The choices in the questions show an application for each of the eight kinds of intelligence. In the end, for scientific purposes, this intelligence must be measured by several tools, such as tests, direct observations, projects or practical applications, and observing the impact of the surrounding environment. After that, it is possible to develop a "principled" perception of the type of intelligence that dominates the person, which helps improve the quality of the education.